StayUncle.com is an Indian hotel booking website like many others, but distinguishes itself through one chief factor. It caters to married and unmarried Indian couples in more than 40 Indian cities, allowing them to book rooms for 10 hours instead of the customary 24 hour window, offering discretion and privacy with local ID proof. StayUncle.com is committed to providing discreet and safe accommodation for Indian couples looking for privacy, which leads to an indecent perception for the brand in the eyes of the general population, raising concerns over whether the platform is used for women trafficking. Considering the unwanted and inaccurate perception for StayUncle.com in the eyes of the uninitiated, the brand wished to distinguish themselves from the notion, communicating their true nature and their uncompromising stance against any activities related to women trafficking. StayUncle.com created a fake website called www.staylaid.com, a website that presented itself as a service where men could contact and ‘book’ women for intimate pleasure without any repercussions and fear of being caught by the police. The website contained various categories, pictures of women and even numerous testimonials from ‘satisfied customers’ that was designed to make it look authentic, making it easier for unsuspecting men to fall for the deception. StayUncle.com collaborated with Buzzoka and brought over 65 media journalists on board in order to generate buzz around the campaign to create a natural and organic outrage and discussion against staylaid.com. Journalists were chosen as Influencers as they were the perfect disseminators for such information and often lead the outrage and support causes on social media. This helped StayUncle.com verify the authenticity of the website, not coming off as an obvious marketing gimmick as many social media marketing campaigns are susceptible to. The Influencers used the hashtag #StopWomenTrafficking in order to protest against the website, and were joined by many more Twitter users leading to the campaign hashtag and message #StopWomenTrafficking to trend on Twitter. The campaign launch was conducted on a Tuesday building on the insight that the journalist community is back in full swing on a Tuesday after sorting through all their baggage on Mondays, thereby ensuring maximum participation from Twitter users that were not part of the Influencer marketing activity. 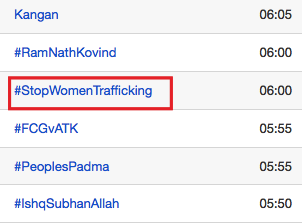 StayUncle.com kept track of the activity, shooting out emails to all the people who registered their email address on the fake website, 5 hours after the #StopWomenTrafficking hashtag began trending on Twitter, and also a Tweet from their official handle, letting the people know that www.staylaid.com was a fake website, communicating the deeper message behind the campaign. The tweet also included the hashtag #StayUncleAgainstWomenTrafficking, clearly associating themselves with the cause, which also helped amplify the message, getting the hashtag trending in third place on Twitter. 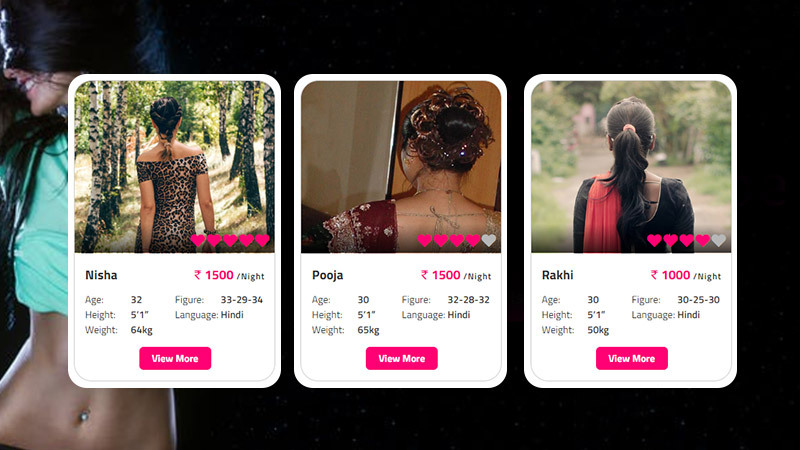 Parallely, on www.staylaid.com, if someone browsed through all the ‘available women’ and tried to make an appointment, they were greeted with a message that educated them about how women trafficking is rampant across the country and how girls are forced into the prostitution. The message was thus delivered to the right people who were unaware of the ground realities of women trafficking, and helped spread the word effectively. Over 13,000 registrations were observed by StayUncle.com on the fake website, with over 1500 being made on the day the campaign went live. 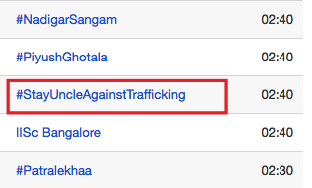 #StayUncleAgainstTrafficking and#StopWomenTrafficking generated a total number of 15K conversations with over 100M Impressions during the campaign debut day. A Reach of over 15M was observed, as the campaign hashtags trended on Twitter for over 8 hours. An Engagement rate of 53% indicated a mass participation from the social media audiences. Connecting to the bigger cause definitely helped StayUncle break any and every wrong idea attached to the brand. The right choice of influencers and timing worked as an added factor. StayUncle has been attributed with bold marketing moves such as calling them blog Naughty Sita and StayLaid adds to the list. Further, the brand has managed to segregate themselves from unethical elements, managing to keep moral police at bay, at least for the time being. The campaign was covered by nearly 150 media publications all over the world, helping StayUncle.com raise a tremendous amount of awareness about Women Trafficking and also achieving their campaign objectives.